MANILA, Philippines - Host country Korea won against Philippine men's national backetball team Gilas Pilipinas on the latter's do-or-die quarterfinal game, 97-95 on Saturday, September 27, 2014 in a match held at Samsan World Gymnasium in Incheon, South Korea. Gilas Pilipinas played without Marcus Douthit, who was benched all game after coach Chot Reyes was not satisfied with the his performance in a game versus Qatar on Friday. The Philippines is currently at 0-2 in the Group H quarterfinal group. Only two teams will advance to the semifinals and both South Korea and Qatar are better positioned to go through. Gilas captain Jimmy Alapag, playing in his final run with the national team, led the way with 25 big points while fellow point guard LA Tenorio finished with 20. Moon Tae-jong of Korea scored 38 big points to lead the hosts victorious. During the first half, Gilas took the 16-point lead. In the third quarter, Korea cuts the lead of Philippines to one point, 72-71. 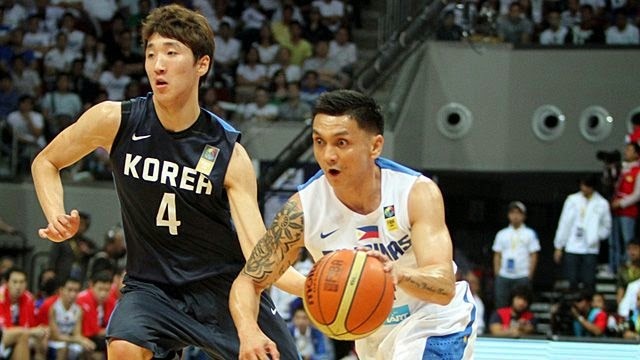 Gilas has suffered their third straight defeat as South Korea stringed together the next five points. Gilas Pilipinas has defeated South Korea the last time they met in the semis of the 2013 FIBA Asia Championship in Manila.